In this episode of Inside Response, learn how we have created flexibility within the team to allow us to adapt to any situation when we do not have a key team member come to work. 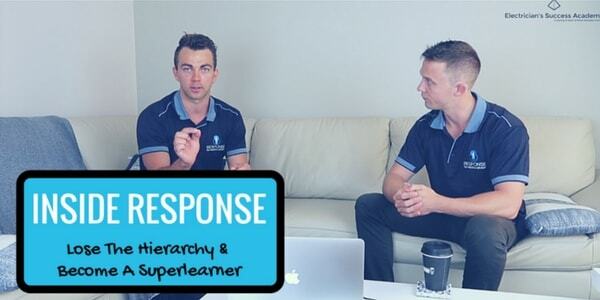 We discuss how you can become a super learner and the most valuable electrician at your electrical company. The ego is not necessarily a bad thing, it is what you think of yourself and it is there to protect you at all times. In this electrical business lesson, you will learn how to adapt your ego to maximise your learning and become a student of every person you come in contact with in life and at work. 1.30: Cross Training your team to protect your lifestyle. 2.30: Strategies to ensure that you aren't crushed when key team members don't come to work. 4.30: To develop a free-style mobile office and model of management. 6.30: Hiring virtual assistance to assist you with basic administration roles. 8.00: Hiring electricians who are willing to learn without ego. 10.00: How a hierarchy limits the flexibility in your team. 12.20: How to deal with criticism to maximise your learning. 13.30: How to understand people and develop an electrical contractor business attitude. 15.30: Why telling people that they shouldn't have a licence is detrimental in the long term. 17.30: How to get someone to NOT listen to you. 20.30: The problem to learning WHAT to do but not WHY. 24.00: How people interpret the things the way they do! 25.00: Techniques to learn from everyone to cultivate an electrical contractor business attitude. 27.40: How your ego protects your FEELINGS but limits your growth. 30.00: How performance does not matter if you aren't demonstrating you are learning. 35.00: How the customer will perceive an electrician with an ego. 45.00: How a business owner can ensure that they are doing to learn with you.